26.05.2016. London, England. 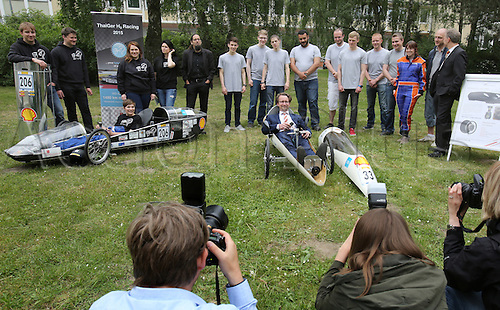 The two teams from Mecklenburg-Western Pomerania participating in the Shell Eco-marathon in London present themselves to State Minister of Education Mathias Brodkorb, who is sitting in the car from the University of Rostock in Rostock, 26 May 2016. To the left is the car from the team from the Fachhochschule Stralsund. The goal of the Shell Eco-marathon is to travel as far as possible with a liter of fuel or the respective energy equivalent. 300 teams from more than 28 countries are taking part this year.